The ACU-TIP tipping bucket is a sediment flushing system designed to remove settled debris from reservoir floors, such as stormwater or CSO retention tanks and sanitary equalization tanks. The system operates by releasing a torrent of fresh water stored in the tipping bucket. The resulting flushing wave progresses down the entire length of the flushway pushing the settled debris ahead of it. The re-suspended debris is then carried by the flush water to the treatment plant for disposal. 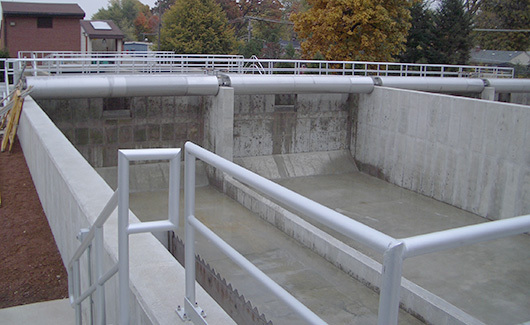 The ACU-TIP has several advantages over other types of sediment flushing systems. Firstly, because the system uses fresh water as the source of the flushing wave, one is assured that no additional debris will be introduced in the tank as the flushing operation is completed. Secondly, in the rare event that additional flushes are required, the tipping bucket’s filling system can be easily re-activated and the flushing sequence repeated. Thirdly, because the ACU-TIP tipping bucket is suspended over the tank and never comes in contact with debris, the need for maintenance is reduced assuring economical and trouble free operation. Finally, the ACU-TIP can be installed in new tanks or easily retrofitted in existing storage tanks. Can be easily installed in new or retrofitted into existing tanks. Virtually maintenance free Permanently lubricated waterproof bearings. Supported on tank back wall, side wall or roof slab. The ACU-TIP tipping bucket’s unique design allows it to rest in a horizontal position when empty. When the fresh water supply is activated, the ACU-TIP reservoir will fill to a pre-determined level. 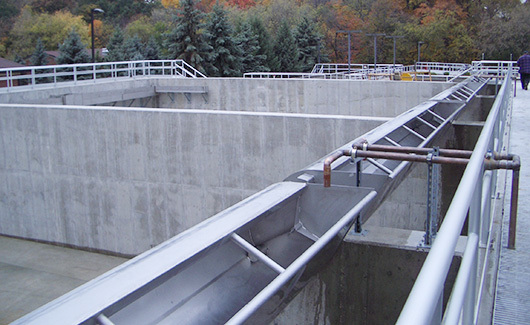 At this instance, because of the ACU-TIP’s specific design, the center of gravity shifts causing the sediment flushing device to pivot backwards (or forwards if required) sending the stored water onto the backwall resulting in a torrent of fresh water running down the length of the flushway, scouring all of the settled debris from the tank floor. Once empty, the ACU-TIP returns to its normal horizontal position ready to repeat the sequence if the need arises. Under normal conditions, only one flush is required to achieve the desired results. Exceptionally, under high loading conditions, more than one flush may be required. Depending on the tank dimensions, the size and therefore capacity of the ACU-TIP will vary thus affecting the fill time of the device. On average, the fill time of the ACU-TIP should be approximately 15 minutes.